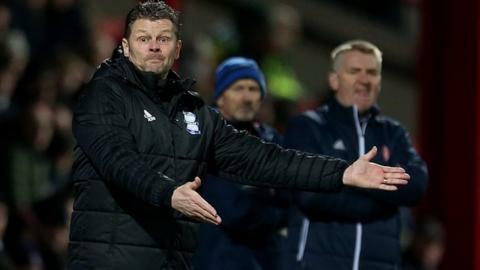 Birmingham boss Steve Cotterill admits Blues have been on a downward curve since their derby loss to Aston Villa. Blues suffered their third straight league defeat, their heaviest since Cotterill took charge in October, when they lost 5-0 at Brentford on Tuesday. They have failed to score during that run and have conceded eight goals. "We get beat in the derby game over at Villa and, since then, it's been hard work picking them up all the time," Cotterill told BBC WM. "On the day, Aston Villa were better than us. That dented them and knocked them back." But Cotterill added that even after the disappointment of Saturday's 1-0 home defeat by Millwall he was expecting better at Griffin Park. "Last weekend we didn't get any tempo. But I had a good feeling coming to Brentford," he said. "We were in good form in the warm-up and, coming back in, I didn't sense anything like that coming. But then we made a mistake for the first goal and it all changed. "Any other God-given day, David Stockdale will save that. But this season has been littered with this type of error. "It happened before I got here and it's still happening." Last season, Blues responded to a derby defeat at Villa Park in new manager Harry Redknapp's first game in charge, with Cotterill as his right-hand man, by then winning the next two matches to stay in the Championship. But, this time around, there has been no such post-derby response. And, just when it looked like Blues had escaped trouble by losing just once in six league games, the Chinese-owned club have been plunged back into danger. They are now back to within a point of the relegation zone going into this Saturday's now vital home date with 23rd-placed Barnsley, who are under new management. "It's tough on everybody right now," added Cotterill. "No matter what team I've picked it's not quite gelled for long enough. "They've been bashed on the head so many times this season it's a continual job trying to get round these mistakes and get enough points on the board." Steve Cotterill was talking to BBC WM's Richard Wilford.